Waiting in the lobby of the Honan Library yesterday to meet a friend, I noticed the course catalogs for adult ed programs in Brookline and Newton. 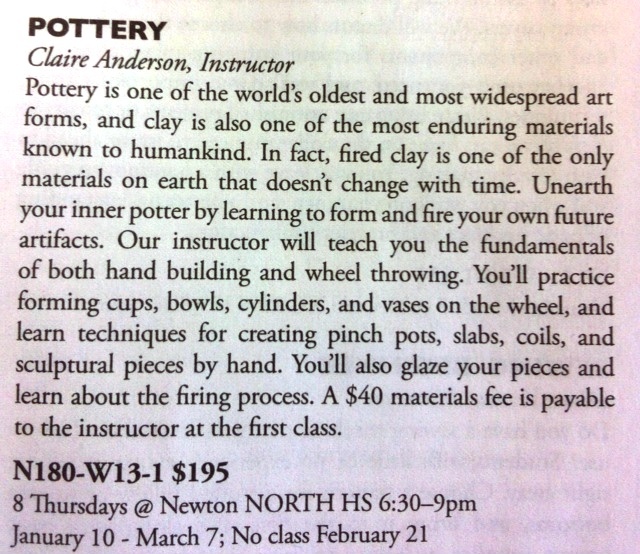 I found these interesting because Harvard is moving its Ceramics program to 224 Western Ave (the former Verizon building, next door to the Dunkin Donuts) from its current location in the basement of a warehouse next to Smith Field. 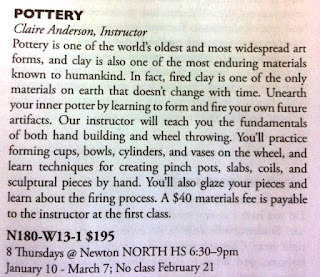 Moving Harvard Ceramics closer to the Allston community seems like a great opportunity for it to become more a part of the Allston community while continuing and expanding its institutional programs. After my visit yesterday, I thought someone at Harvard might realize that someone should locks the doors of their unlocked empty warehouses. Apparently not. 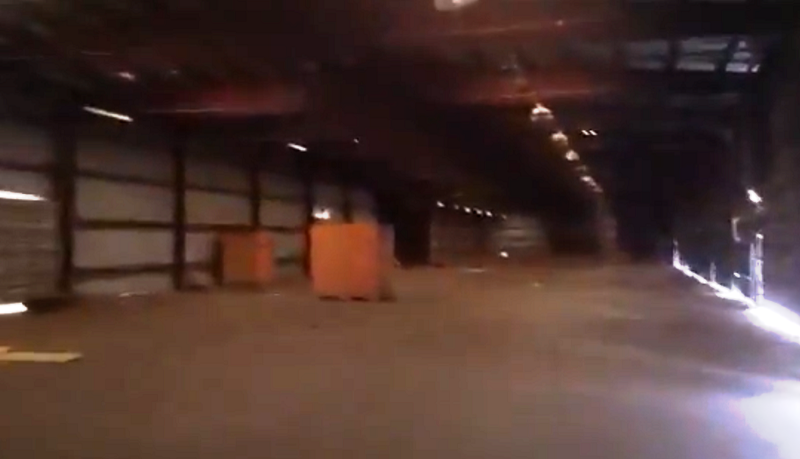 Not only is the Romar building vacant, but the Michael's Moving & Storage building is too. Travis Street? Why Not Romar? For years, Allston has hosted the most unattractive parts of Harvard's campus like this maintenance yard along the east edge of Smith Field. Now, as part of its Barry's Corner revitalization project, Harvard wants to move this stuff from one side of Barry's Corner to another. But in Harvard's vast Allston real estate empire, how can this be the best option for the community? I mentioned a few months ago Romar's impending departure from Harvard property in Allston. Harvard's 10 year Master Plan proposal includes less than half of the Romar site. I went over to the Romar site this morning to see if Romar is still there. If the property is empty and not needed by Harvard for other uses in the next 10 years, it seems like a great place for Harvard's parking lots, mail room services, storage space, the University's recycling program, and maintenance and upkeep of the University's fleet of buses, vehicles, and other maintenance equipment. In defending its selection of the Travis Street location, Harvard claims that "Harvard's undeveloped property to the east of the site was also considered, but would have required new construction rather than adaptive reuse of existing structures. The selected approach [Travis Street] is seen as most desirable from the perspective of functionality, sustainability, and overall neighborhood quality of life." How can that be true when Harvard has this empty warehouse where it would have no impact on Allston's quality of life and it would leave the possibility of some truly neighborhood-friendly use on Travis Street in the future? Interested in how Allston and Brighton could be better connected to the Charles River? Do you like to walk, jog, run, or bike along the River? If so, please join us on Monday, December 17 to learn more about the Herter-Greenough Loop! 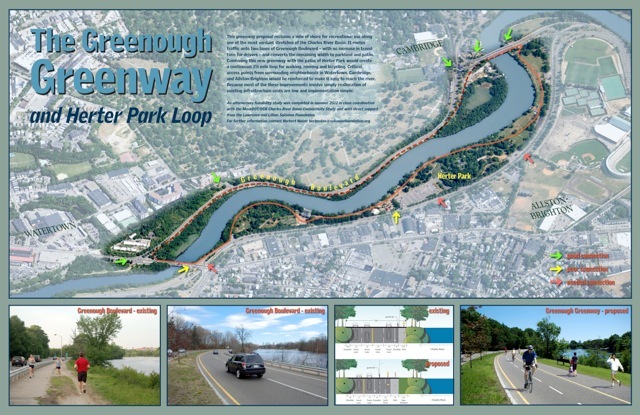 The Solomon Foundation, in partnership with the DCR and MassDOT, has sponsored a design study to transform Greenough Boulevard along the Charles River into a fully accessible greenway for walkers, joggers, and cyclists as well as drivers. By linking this mile long greenway to Herter Park at the north end of Everett Street, a seamless 2 1/2 mile loop path around the river would be created. The plan also identifies the need for improved access from Alston and Brighton. Herb Nolan, the Deputy Director of the Solomon Foundation, recently met with DCR staff and some of our elected officials and is interested in getting more community input. The meeting will be at 28 Mansfield St on Monday at 7pm. Pizza will be provided. "Much of the land is now a blank slate, for potential academic use far in the future." "Gone are the reconfigured bridges over the Charles River, the new undergraduate Houses, the 10 million square feet of building space, and the performing-arts pavilion at Barry’s Corner. In the vicinity of the latter, a parking lot is now contemplated for the construction vehicles used to build the mix of housing, retail, and athletic facilities that administrators are proposing for the land Harvard began quietly acquiring in 1988, 25 years ago." "The net result, at least in the most public-facing locations of greatest interest to Allston residents, is a substantially more modest 10-year undertaking than contemplated even 18 months ago." "The totality of projects planned for Allston in the next 10 years is perhaps more inward-looking than residents might have wished. Chief among the recommendations is an incentive for developers to build more housing of all kinds – but especially affordable and middle-income housing – in exchange for added height and density. If approved, the new zoning would allow heights of up to 100 feet by right – up from the current allowable height of 80 feet – and 120-160 feet by a special permit on the condition that at least 20 percent of the bonus-floor area be devoted permanently to middle-income housing. The recommendations stipulate that any heights above 80 feet along Massachusetts Avenue be devoted only to residential use and that no two adjacent building facades have a combined height of 220 feet. This is interesting. Harvard has a lot of property in its Allston/Brighton land-bank that doesn't seem to be doing anything to support education & research. Maybe Harvard will sell some of it and allow it to be put to better use. "University spokesperson Kevin Galvin wrote that Harvard had been reviewing its off-campus property to see how it fit with the University’s goals of supporting education and research." Another Speedway meeting - Will something happen this time? DCR hosted another event yesterday with the hopes of someday having the Speedway property at the end of Western Ave renovated and in active use. I've been going to these meetings for 6 years, and I'm not sure why there might be a happier ending this time. But if nothing else it is nice that DCR is making an effort. It still is an amazing old building but my is it in horrible condition. I can't imagine how any for-profit or non-profit could make it financially viable to pour millions & millions into making it habitable.